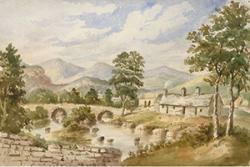 A watercolour showing Pont Rhiwaedog the hamlet of Rhos y Gwaliau, near Bala, painted by Mary Ann Malkin, 1846.: (C) Crown Copyright: RCAHWM 2017.European tourists visiting Wales will be able to read historical accounts of visits to Wales through the ages via a new portal to be completed next year. Follow-on funding from the Arts and Humanities Research Council (AHRC) means that researchers working on the successful ‘European Travellers to Wales’ project will be able to share some of the historical travel writing that they have unearthed with modern tourists to Wales. Following completion of the work led by Bangor University with Swansea University and the University of Wales, Centre for Advanced Welsh and Celtic Studies (CAWCS), and in collaboration with the Royal Commission on the Ancient and Historical Monuments of Wales and Visit Wales, visitors will be able to follow in the footsteps of historical travellers by following suggested modern ‘itineraries’, and reading their writings, enhanced with historical images from the Royal Commission and other historical collections. The original project by modern languages experts uncovered over 400 accounts of visits to Wales by European travellers writing between 1750 and 2010, four times as many as the researchers had anticipated finding. “We’ve found previously unstudied accounts providing insights into how others have viewed Wales,” said Professor Carol Tully, who is leading the project from Bangor University’s School of Modern Languages & Cultures. “Some of the writing is in diaries or letters, and many were not intended for publication. The breadth of the topics discussed shows a long-standing interest in Wales. Not all the visitors were tourists in the modern sense, some were refugees or on business, but they all provide insights into Wales by visitors from other European nations,” she added. With tourism from Britain and Europe contributing to £5.1 billion annually to the Welsh economy, a figure which is expected to grow, the portal will be a valuable resource for Visit Wales’ in promoting Wales’ landscape, history and culture. A Telford itinerary is being planned. 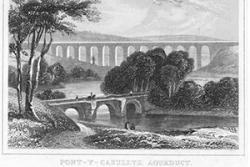 This is an Undated etching of Telford's Pontcysyllte Aqueduct. : (C) Crown Copyright: RCAHWM 2017.These days, most people undertake online research on their intended travel destination and this new digital resource, which will be available in a range of languages, will be accessible through the Visit Wales website and will provide themed itineraries using the historic texts. The majority of texts are in French and German and so will naturally appeal well to those popular markets, though there are also accounts in other lesser-used languages such as Breton, and from travellers from Poland, Hungary, Scandinavia and the Czech Republic.